My name is Achan Aida Agnes a social worker of Meeting Point International following the VSLA groups in Naguru. In 2017 after sharing the money saved, I managed to Identify one of our clients Ayoo Sarah, who was enjoying a success from the VSLA group’s activities. Sarah joined Meeting Point International in 2006 after she was tested and found out to be HIV positive together with her husband. She is a mother of 6 children and altogether lives in a family of 8 members. Life in this family was not good because of low income earning. The family used to eat once a day and sometimes went without meals. Her husband lost his job because of a health problem and it was hard for them. The business Sarah was doing needed a lot of energy but due to her sickness, she couldn’t continue operating the business of brewing local Waragi (a spirit). Sarah joined the saving group in 2013, though Sarah went through many trainings about the VSLA she was not contented with what was taught. She believed that they were going to steal her money. In the first year, Sarah hadn’t saved well because she knew that they were going to steal her money. In the end of the year when the group was sharing, her money was so little compared to her group members who saved well. In the second year (2014), Sarah decided to move together with her friends. She stopped doubting and started to buy all the shares hence saving well. At the end of the year, she was among the happy ones because she had saved a lot of money, together with her friends. It was in the second year when Sarah’s eyes opened and realized that saving groups were so good. She could easily get loans from the group. 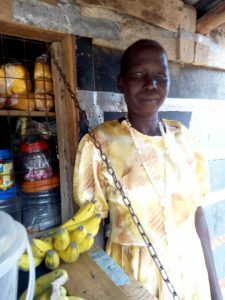 Through financial literacy and Select planning and management, she managed to identify a business of selling water and soft drinks, setting up a stall for selling food stuffs like onions, tomatoes, bananas and many others. In 2015 (her third year) after sharing the money saved at the end of that year, she managed to buy a popcorn making machine adding onto her existent businesses. She was now able to get Ugx 20,000/= per week from water, Ugx 20,000/= per week from selling food stuff, eventually making Ugx 40,000/= per week. She was able to run this business in 2016. In the end of 2017, when they shared the money, she bought a motor cycle which operates in Kampala. 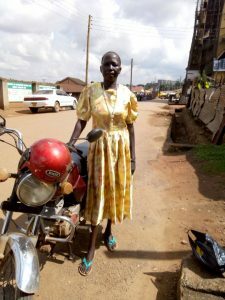 She employs someone to operate the motorcycle and she collects Ugx 50,000/= from him per week and at the end of the month, she saves Ugx 200,000/= from the motorcycle business. Sarah is now happy, she managed to rent a double room with electricity and she can cater for school requirements for her children. They are happy because they can now get their basic needs and they now have 3 meals in a day.